Thanks to the advent of technology, the number of mobile phone users are increasing day by day. You’ll be shocked to hear that by 2019, this number will cross the 5 billion mark! While mobile phones may have made our life easier, they have also opened up domains for many cybercriminals who are adapting and using new methods to profit from this rapidly growing number of potential victims. What’s more, apps are used for nearly 90% of usage on mobile phones and tablets making it the number one source for cyber-attacks. People are using apps to access everything from online banking to shopping and even controlling home devices. User data is like a goldmine for cybercriminals, as they can access anything from credit card details to email passwords and user contact lists. Users have also been scammed into downloading malicious adware, and at times, they unknowingly subscribe to fraud paid services. This is why a lapse in any mobile app’s security is a daunting scenario for app owners and developers. According to a study, more than 60% of companies reported that an insecure mobile app caused a data breach, and 44% out of them did not take any immediate action to secure their app against further potential cyber attacks. So, if you are an app owner or developer, start working towards certain frameworks and tools that provide ease and security to your users. Think about the ways you can avoid the mentioned security challenges and protect your app from cybercriminals. To make your tasks easier, I have listed some of the mobile app security best practices that will benefit you as an owner and also provide your users with a safe and secure online experience. The first step towards securing any mobile app is to start by designing a threat model from the very beginning. Think like a hacker and identify every shortfall of your app’s design. Only then will it be possible to implement effective security strategies. You can also hire a professional security team to play the fake bad guys. It is a great way to test the security of your app as they throw different vulnerabilities at you. Furthermore, if you are a growing eCommerce business and want to develop an online shopping app that can process sensitive information such as financial transactions and credit card credentials, consider the consequences that will occur if a security breach occurs. Ask yourself: in what ways can user privacy be compromised, and how you can prevent it from happening? Keeping safety as a number one concern from the very beginning will give you ample motivation regarding security measures for your app. Online security starts with the device that the consumer is using to access your app. Each mobile operating system requires a different approach for its security, whether it is an iOS or an Android system. Developers must understand that the data stored on any device can drive potential security threats. This is why you should consider encryption methods like 256-bit Advanced Encryption Standard to keep data safe in the form of files, databases, and other data sources. Also, when you are formulating the mobile app security strategy, keep the encryption key management in mind. In the case of Apple, it has strict policy enforcement practices. Being an app owner, you can restrict any user from installing your app if you feel that the security of the user device seems compromised. One of the most effective ways to manage iOS devices is to take help of mobile device management (MDM) or enterprise mobile management (EMM) product. There are many vendors such as MobileIron, MaaS360, and Good Technology that offer their services in this regard. Apart from this, you can use the Microsoft Exchange ActiveSync protocol as a policy management tool if you are looking for a cheaper and easier to use option. Android phones, on the other hand, are a bit trickier to manage. Since they are relatively cheaper as compared to iOS devices, they often become a source of a security breach. You should only be using Android for Work (A4W) in the enterprise. This version of Android encrypts the device and separates personal and professional apps into two categories. With the combination of the right devices, updated mobile operating systems and MDM, you can provide first level security for your mobile app. App wrapping is a term that is used to define a methodology that segments your app from the rest of the device by capturing it in a secure environment. You will automatically get this option if you are taking help from an MDM provider. Just set a few parameters, and you can segment your apps without any coding required. One of the most crucial components of mobile app security is to implement strong user authentication and authorization. You never know who is accessing your app. A seemingly simple question, “Who are you?,” can help secure your device against malware and hackers. User authentication must include all aspects of user privacy, identity and session management and device security features. Try to enforce 2FA (two-factor authentication) or an MFA (multi-factor authentication). You can get technologies like OpenID Connect protocol or OAuth 2.0 authorization framework on board. Read the quarterly reviews of Apple’s security guide. Check out the latest code samples at Apple’s developer site. Analyze static code using a commercial tool. Make sure that you use APIs to manage all app data and business logic. API is a very useful tool for the mobile world, as they are the crown jewels for any enterprise. All data, whether it is in transit or at rest, should be secured. For data in transit, you can use SSL with 256-bit encryption. For data at rest, you should secure the origin of the data as well as the device itself. Remember, each API should have an app-level authentication. Make sure you validate who is using the service and limit sensitive data to memory as it can easily be wiped off. When it comes to addressing your mobile application’s security, think that all mobile devices accessing the app are insecure and hackers can easily capture the data flowing to and fro from your app. It doesn’t mean that you’re overly paranoid. These assumptions will help you stay on top of your security game, and you will always look out for new ways to harden the security of your mobile app against the most common security failures. There are many other practices with which you can toughen up the security of your app, but these 6 tips will give you a basic framework that can be applied to any business, irrespective of its size. Which strategies do you use to protect your mobile app against cyber attacks? Are there any websites that you’d like to enable two-factor authentication on that weren’t in the list above? The Fortnite team announced it will reward users who enable two-factor authentication (2FA) on their accounts with a free emote. 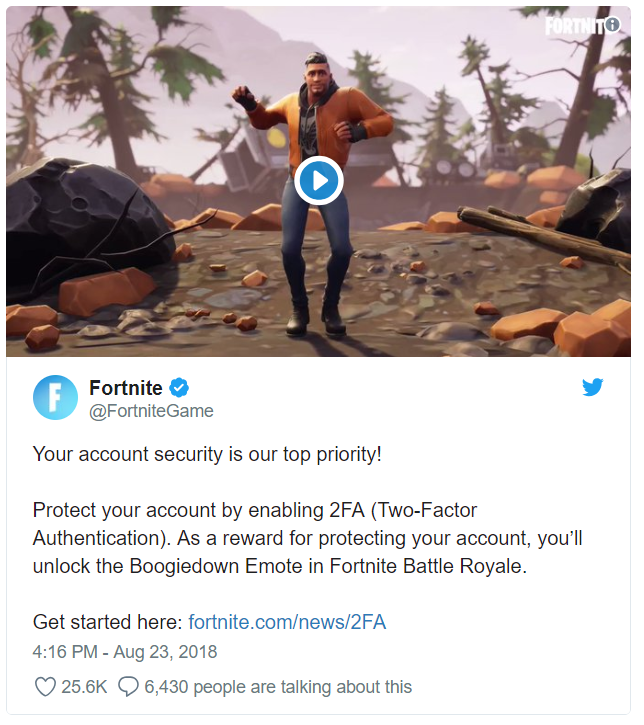 On 23 August, the makers of the popular online video game revealed an incentive to help users boost their account security: in exchange for enabling 2FA on their accounts, gamers would receive the Boogiedown emote for free in Fortnite Battle Royale. On a page linked to in its tweet, Fortnite explains that users can enable two-factor authentication to receive verification codes either via email or via an authenticator app installed on their mobile device. The latter option is the more secure of the two, as an app like Google Authenticator can help protect users’ Fortnite profiles in case their email accounts are ever hacked. In many cases, users can also employ that same authenticator app to protect their emails against an account compromise. Team members recommend that Fortnite users click here to get started. They also make clear that they’ll never ask users for the account passwords. If they receive such a request from someone posing as a Fortnite employee, they should alert the real Fortnite team using the “Contact Us” feature. Fortnite isn’t the only game that’s used an in-game reward to encourage users who might not otherwise be concerned about their web account security to enable 2FA. Video game developer ArenaNet awarded players of Guild Wars 2 who enabled SMS-based login codes, a 2FA deployment which doesn’t always guarantee account security, with the Mini Mystical Dragon as a free pet. Even so, ArenaNet and Fortnite are in the minority when it comes to video game developers, or tech companies in general, who put a premium on users taking their account security seriously. In the prevailing absence of such incentives, it’s up to users to take the lead on protecting their accounts with login verification codes. Here’s a resource that explains how you can enable this additional login step on many of the web’s most popular services. Industrial control systems are essential to the smooth operation of various national critical infrastructure. While once segmented from the web, these systems are now becoming increasingly more networked and remotely accessible as organizations transform to meet the digital age. This development potentially exposes industrial control systems to digital threats. One of the most serious threats confronting industrial control systems today is the Internet of Things (IoT). Organizations and users are becoming more and more dependent on Internet-connected devices, so much so that there’s not enough time to secure them. Such hype has enabled the creation of threats like VPNFilter, a type of botnet which targets routers, network access storage (NAS) devices and other IoT products. In May 2018, researchers observed that VPNFilter had infected half a million IoT products in what Ukrainian officials believed were Russia’s preparations for a digital attack. Less than two months later, Ukrainian law enforcement thwarted an attempted VPNFiler attack by Russian agents against a chlorine station. The IoT threat facing industrial control systems is expected to get worse. In late 2016, Gartner estimated that there would be 8.4 billion connected things worldwide in 2017. The global research company said there could be approximately 20.5 billion web-enabled devices by 2020. An increase of this magnitude would give attackers plenty of new opportunities to leverage vulnerable IoT devices against industrial control systems. Concern over flawed IoT devices is justified. Attackers can misuse those assets to target industrial environments, disrupt critical infrastructure and jeopardize public safety. Those threats notwithstanding, many professionals don’t feel that the digital threats confronting industrial control systems are significant. Others are overconfident in their abilities to spot a threat. For instance, Tripwire found in its 2016 Breach Detection Study that 60 percent of energy professionals were unsure how long it would take automated tools to discover configuration changes in their organizations’ endpoints or for vulnerability scanning systems to generate an alert. Even so, 70 percent of participants affirmed it should take only minutes for those same solutions to detect an alteration. Industrial professionals would be wise to not underestimate threats against industrial control systems. That’s because the costs of disruption can be significant to the business. In response to a 2016 ransomware attack, Michigan’s Board of Water & Light ended up paying approximately $2 million dollars for digital security experts and a law firm to assist it in its recovery and prevent similar attacks from occurring in the future. Even worse, a 2012 malware attack cost Saudi Aramco – the world’s biggest oil company – approximately $1 billion, as the company needed to replace 35,000 computers damaged by the attack. It also hired at least six firms and dozens of experts to help with the recovery, reported Reuters. If your business has an industrial control system footprint now is the time to evaluate how you’re securing that environment. Industrial companies have accepted the reality that digital threats can have tangible consequences. This perception is perhaps heightened by recent attacks that were specifically designed to affect physical operations and have proven capable of doing so. It is vital that organizations properly secure their critical infrastructure by investing in robust cybersecurity strategies that involve proper foundations of critical security controls and layers of defense. Failure to do so will result in a major breach that will cause catastrophic failure, which is a significant concern among security professionals as a critical disaster could result in significant loss of life. The Healthcare industry by its very nature is populated with some amazing people who are devoted to those in need of physical and mental care. Given this noble cause, it was perfectly understandable for them to ask “Why would someone attack us?” when WannaCry hit their sector. At the time of the attack, security teams across the country were rallying to resolve the issue, with many (I’m sure) searching for evidence that they had once warned their organization of the dangers of poor cyber-response arrangements and poor patch management. Dare we ask how many servers compromised by WannaCry only required a reboot to enable the patch – denied only because no agreement could be reached to arrange a maintenance window? As sad and as controversial it sounds, sometimes it takes an incident of this magnitude and publicity for organizations to remember the basics. Despite the irresistible urge for some to shout “I told you so,” we must understand how we can improve now that we have the attention of executive management who wish to avoid the implications of another WannaCry. Organizations want to try new things and do not want to be bogged down with procedures and policy. However, we must be mindful of integration and support. Get the right contracts in place; secure robust support agreements and software assurance. Do not become dependent on a third-party application. We all know solutions with security flaws with vendors having no appetite to fix them. Finally, be prepared to forgo the usual third-party assessments for these smaller firms. Streamline it, and document exceptions! If you cannot extract data from a solution to demonstrate value and outcomes, why bother with it? And critically, look for a common integration and data extraction tool rather than a swathe of bespoke interfaces known only to the developer who left the organization two years ago. Support functions cannot be expected to support operating systems that are no longer supported by the vendor. Like the financial sector, it will only be a matter of time that the healthcare sector will be required to provide decommissioning plans and timelines. Be proactive with your hardware; refresh and ensure your third-party vendors are contracted to ensure their applications are supported by the latest technology and operating systems. Finally, we must have the courage to stand up for what we know is the right thing to do: do not be swayed by pressure to adopt bad practice or technology. Whilst saying “No” is never really an option, the transferal of risk certainly is. All healthcare organizations need to take steps to strengthen the security of their systems so that they can ensure the availability of critical medical services and protect their patients’ data. Such measures are especially important in the case of defending against vulnerabilities like EternalBlue, the Microsoft SMB flaw which WannaCry exploited in 2017. CVSS risk scoring is a good start. But in these types of instances, such low-medium-high scoring is not of any use because the vulnerability will show up as “high” in every part of the business where critical systems/assets that provide the “business as usual” state are in the same category as non-critical systems. This is where Tripwire IP360 can assist. Tripwire not only provides the CVSS risk scoring but also adds a unique way the assets are weighted depending on criticality to the business, amongst other criteria. This creates a way for limited resources to apply patches quickly to the critical systems, thereby providing the secure “business as usual” state for the business. In the meantime, Tripwire Enterprise can be utilized to monitor the network for any changes or drifts of compliance and policies, providing real-time notification to the resources on anything that is detrimental to the estate so they can address them immediately.